Up until recently its providence was not clear. 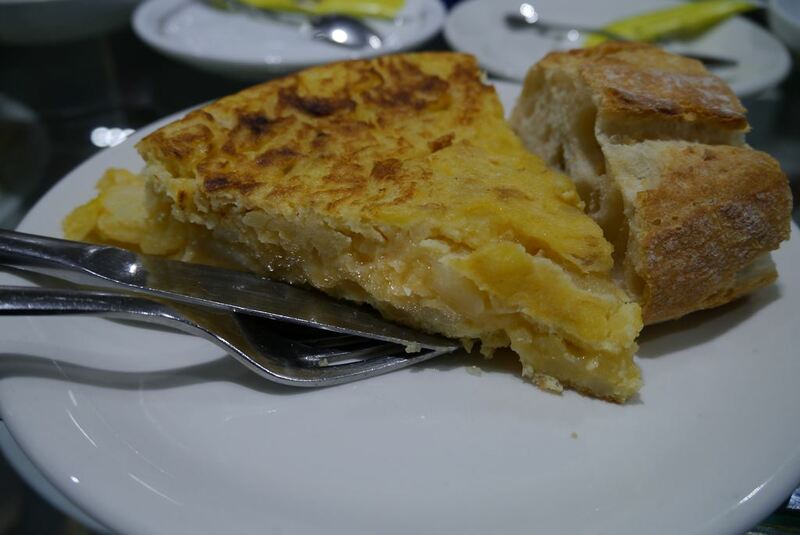 The first Spanish omelette recipe was attributed to Navarre in 1817 – however an earlier recipe has recently been uncovered in Villanueva de la Serena in Extremadura dating from 1798 and the town is now championing itself as the home of the Spanish tortilla. There are as many variations of Spanish tortilla as there are days in the year. And everybody in Spain likes their mother’s recipe best. We are often asked why the Spanish omelette is so popular. We think it’s because it’s such a versatile dish – it tastes great hot, cold or at room temperature. It’s perfect for breakfast, for a mid-morning snack, inside a breadroll for a packed lunch or picnic, served with a salad as a meal, sliced in wedges for kids parties and diced in cubes for evening nibbles with drinks. The best place to sample Spanish tortillas (and pick up tips) is your local Spanish bar. This is where you’ll find the standard tortilla which is called ‘tortilla normal‘ and you should also find the ‘double decker’ of two tortillas with fillings such as ham and cheese, chatca (a crabstick and mayonnaise mix), a BLT with tuna variation (ham, lettuce, tuna, mayo and tomato), and tuna & mayo. If you plan your trip carefully, you might find yourself in one of the cites that runs a tortilla championship over a week or a fortnight. The idea is generally for the city’s residents to sample the tortillas in each of the bars and judges do the same. Winners are announced at the end and get a write-up in the local press at the end of the festival. At the last competition we were at in Santander, we tried organic-egg tortillas, tortilla creamed with mussels, tortilla bolognese, and tortilla served with octopus, peppers, Roquefort, salmon, tripe and duck. 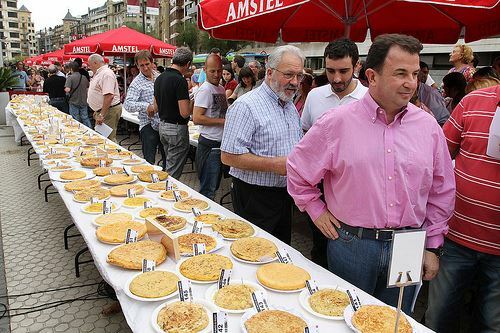 Logrono in La Rioja runs a similar event and this year’s competition featured a tortilla made from spaghetti and a stewed tortilla! Some cities such as San Sebastian open the competition up to the general public so if you are in town you could make one and bring it along just like the hundreds of other homechefs of all ages. Peel the potatoes (and onion), slice in cubes or thin slices and fry on a medium heat. Remove from pan when golden and drain excess oil. Beat the eggs in a large bowl and add the fried potatoes and fried onion. Ease the mixture into the pan and cook until brown underneath. Turn over by placing a dinner plate, the same size as tortilla, on top of the mixture and turn the whole lot over. Then slide the mixture with care back into the pan. Fry for flipside for another few minutes until cooked and then remove from the heat. Easy. 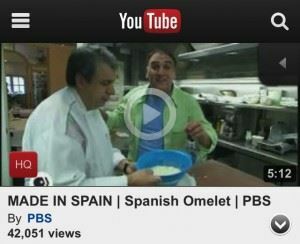 See how Spanish chef Jose Andres explains the steps (click on image below to load the video) with two generations of Galician chefs in A Coruna. Watch out for the tip about making a hole in the tortilla when it’s been flipped to re-insert some of the oil and eggs mixture – it keeps it moist and juicy. Variations to this tortilla recipe would include grating, steaming or boiling the potatoes before frying. And the shape of the sliced potato varies from chef to chef. The consistency of the cooked egg varies also – some love it runny, others insist on it being set. Each chef or local bar has their own twist – for example in the famous Naroki Bar in Vitoria (now sadly closed), the chef made ‘stained’ tortilla using the flavoured oil from frying chorizo and pouring a dash over the cooked tortilla slice thus ‘staining it’ and at the same time elevating the simple dish to something far more special. Other tricks we’ve comes across are adding extra egg yolks to the mix. Or holding back one egg from the potato and egg mix and cracking it into the mixture just before it goes into the pan. Now that you know how to make the traditional tortilla, we thought we’d show you how to break the rules. This tortilla is incorrectly attributed to Michelin-starred Ferran Adria of El Bulli fame. It’s easy to see why. This layered combination of caramelised onions, egg and potato puree – served in a margarita glass with a drizzle of olive oil – pays ‘homage’ to the traditional recipe without looking anything like it. Yes. You read this correctly. And this tortilla made from crisps – [yes potato chips] – is correctly attributed this time to Ferran Adria. It’s a very controversial time-saving solution to frying potatoes. Adria suggests using crisps cooked in olive oil which are easy to pick up in any Spanish supermarket but not so easy outside Spain. Try get the most natural looking potato crisp you can find. You can see the process in the video below by Richard Blais. [We would omit the chives and cream and use olive oil]. Did you see how Richard avoids flipping or turning the tortilla by grilling or baking the top of it in the video above? Most international TV chefs recommend this. For example, Jamie Oliver bakes his tortilla (having controversially added chorizo to the mix). And Martha Steward adds saffron to her mix and bakes hers. Our advice? Find a plate that sits inside your frying pan and go for it. The village of Padron in La Coruña has been preparing giant tortillas every year since 1987 – when it appeared in the Guinness Book of Records. 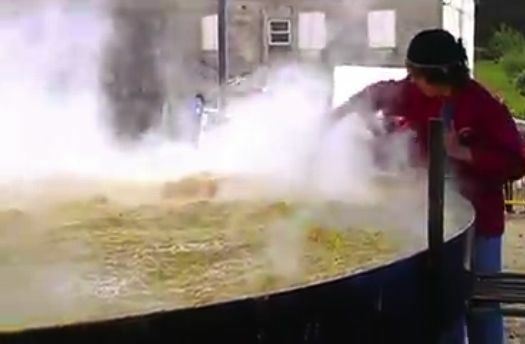 This year’s omelette was consumed by 1,500 people. The ingredients? 1,500kg of potatoes, 8,000 eggs and 320 litres of oil. It took 40 people just to peel the potatoes. And a crane was used to turn the 3 metre wide ‘frying pan’. See it being prepared below by clicking on the photo of the giant tortilla. Posted in A Coruña, Food & Drink, Galicia, Insider Spain Guides, La Rioja, Navarre, Popular Posts, San Sebastian, Spain, Vitoria and tagged Ferran Adria, how to make, Jamie Oliver, Jose Andres, Martha Steward, potato omelette, recipe, Spain, Spanish tortilla, tapas.